I can honestly say we never complain about not having anything to read. Pratchett is one of the few authors we read over and over and over again. I don’t normally do this, sit down and write without a purpose in mind. But today, I felt like I needed to. Last week, the world lost a funny, witty, talented, courageous, and all-around amazing author, and though I never met Terry Pratchett personally, I’m going to go ahead and assume, based on what I’ve read about him, he was that kind of person outside the pages as well. A petition to Death himself asking to bring Terry back (over 29k signatures at the time of this writing). Embedding his name in code to ensure he lives on forever. Memorial articles written by those who knew the author (I’ve posted just one example of many). Interviews on YouTube that turned into memorials about the author. Twitter comments from those who knew him. Drawing pictures (most of which involve Terry meeting Death), remembering quotes, sharing photos. As for me, I signed the petition, got lost trying to understand the code (not to mention trying to understand Reddit), read the articles, listened to or watched the interviews, and viewed the pictures. Now I’m sitting in my living room thinking about everything. About the books he wrote, the life he lived, the lives he touched and yes, I’m thinking about death, too, because it hit close to home over here last year. I can imagine what Terry’s friends and loved ones must be feeling, in the way that anyone can imagine the grief that follows such a loss. I didn’t know Sir Terry, but I do know the world is a poorer place without him in it. I was visiting Sweden for the first time when I picked up a Terry Pratchett book. I think. I was either watching a blizzard drop snow like sugar sprinkles outside, or I was in California. 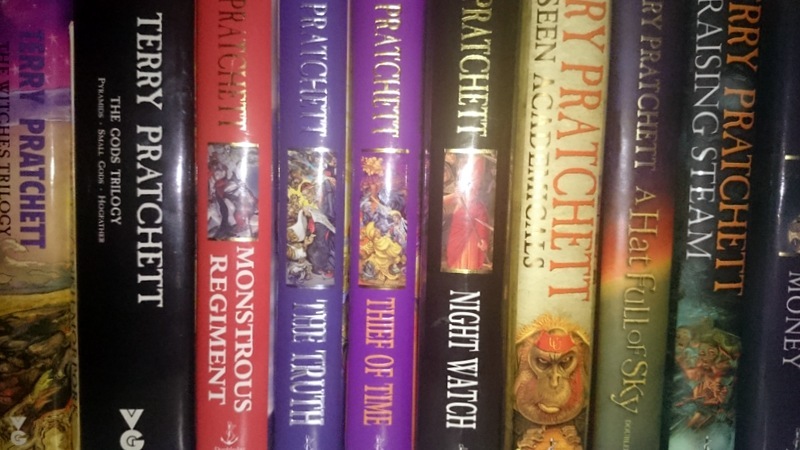 Okay, maybe I don’t remember where I was (I’m almost positive it was during the snowstorm), but I do remember who gave me my first Terry Pratchett–my husband. The book was The Colour of Magic. When I handed it back to him, I told him it wasn’t funny. I didn’t see what all the fuss was about. I remember saying something to the effect of, ‘You and I must have a different sense of humor.‘ I honestly didn’t get it. Even the luggage at the time didn’t make me laugh. My husband, stubborn guy that he is, told me to give the guy another chance. I was going to LOVE him. I hesitantly agreed and picked up The Light Fantastic. I didn’t want to finish the book. I really didn’t get this author with the beard and the strange hat and I didn’t understand why my husband was so hung up on the guy. It was like a man crush. Finally, my husband gave me Guards! Guards! And it was one of those once-in-a-lifetime where everything comes together moments. I got it. I really got it that time. I was hooked. I dove into Pratchett’s stories and Discworld surrounded me. His characters made me laugh and cheer. I connected with them and I loved how each one was so different from the others. Most of all, I loved how these crazy characters could say some of the things we were all thinking, and they could get away with it! I had to read the next book. I devoured Men at Arms. Then Feet of Clay, Jingo and Night Watch (still one of my all-time favorite go-to read-again-and-again books). Sometimes I skipped the order, it didn’t matter. Over the years, I’ve read most of the Witches books, the Tiffany Aching books (who doesn’t love those Feegles? ), the Moist books, all the Vimes books, and a few of the stand-alones, like Nation and The Long Earth. And yet, I STILL haven’t read some of his best work, like, Mort. When I get that one, I’m going to savor every word. Now that he’s gone, I feel this great loss in the literary world, especially within the fantasy realm. Fantasy still gets a bad rap, for some strange reason, and one of the brightest stars under that banner is gone. Thankfully his words aren’t. I hope his books go on to touch thousands of new readers, and old ones, each year and since his name is now embedded into the fabric of the internet (however that works), he will live on. His words will do more than entertain readers though, they’ll also inspire writers across the world. I’m thinking of David Grimstone and his post about Terry’s encouragement at a time when he needed it most. David was so frustrated as a new writer, he wrote to Terry about giving up. Terry wrote back! You can read about it here. Once David posted that blog post, Sir Terry wasn’t just speaking to one person anymore, he was telling hundreds of other writers to essentially keep going. I’ve repeated the words he wrote David to myself on days when I feel frustrated, just as I imagine others will do throughout the future. A retired school teacher who’s just discovered his passion for writing and wondering if he’s out of his mind. A fourteen-year-old with a million dreams and a thousand doubts. An exhausted mom who wants to believe she doesn’t need to choose between being a mom and being a writer. Terry’s words will live on, inspiring anyone who runs across them. Telling them not to give up on their dreams. Over the past year I’ve asked my own questions about life and death, and haven’t received many answers. Sometimes I avoid the questions, because to be honest, they hurt. Sometimes, when I think about those I know who’ve passed on, my chest feels like it’s ripping open, a giant lump grows in my throat and I have to stop thinking about the questions because if I keep going, I’ll probably find answers I don’t want to hear. Answers that might even be more painful, at least at first, than the questions–mostly because they don’t say what I want to hear. I’m angry about death. And I wonder if those are the times I should stand up, square my chest, look those feelings in the face, pull out a pencil and start writing. I haven’t done that yet. I blame it on the latest cold I have, but I know that’s an excuse. I tell myself I’m already working on something. Another excuse. One day, I’ll have to face those hard questions and answers. I only hope I do so with the same spirit and aplomb as Terry Pratchett.